You don’t need dairy to make a killer plate of nachos! 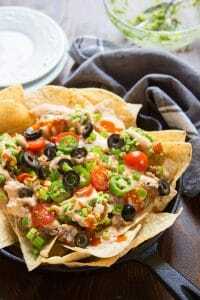 Piled high with refried beans, creamy guac, and diary-free queso, these vegan nachos will be a hit with vegans, vegetarians and omnivores alike. Watch out, because they’re addictive! At more than one point during my teens I’m sure I made an entire meal out of restaurant nachos. Hey, I was vegetarian, and sometimes there’s just nothing else on the menu that you can eat! In reality, I probably could’ve put some type of meatless meal together, but can you blame me? I had an excuse to eat chips and cheese for dinner. Among other excuses to make a meal of nachos: the Super Bowl. This is a rare opportunity, particularly if you’re vegan, because my old excuse doesn’t work for vegans at most restaurants, where the nachos are made with actually dairy-based cheese. So go and make a meal of these this Sunday, if you can handle it. Or maybe just snack on them and share with your friends. Come to think of it, option 2 is probably a better idea. 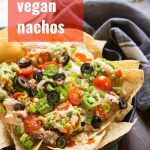 So, how does one make vegan nachos? There are 2 keys: (1) killer dairy-free cheese sauce, and (2) lots of other delicious toppings. There are lots of ways to make vegan cheese sauce, and I’ve already share recipes using cauliflower and sweet potatoes. Feel free to use one of those recipes if you like. This time around, I wanted to try something different, so I made my queso with a base of raw cashews and potatoes. The cashews supply richness, while the potato thickens and gives the sauce a nice, cheesy body. Boil the cashews and potato together — no need to soak your cashews! Garlic, onion powder, nutritional yeast and some hot sauce add some cheesy flavor. 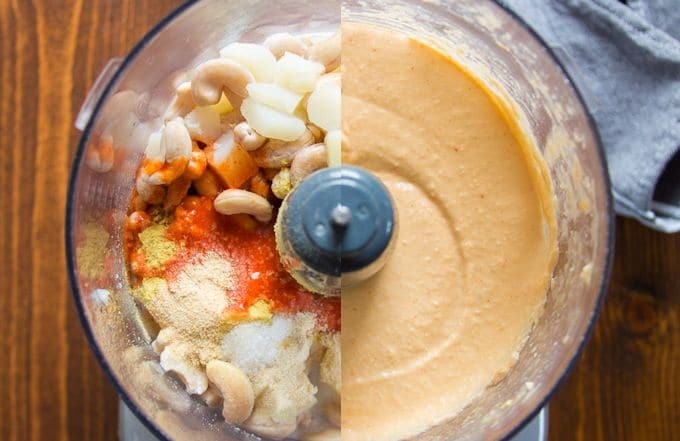 Put everything into a food processor with a bit of non-dairy milk and blend until smooth and creamy. 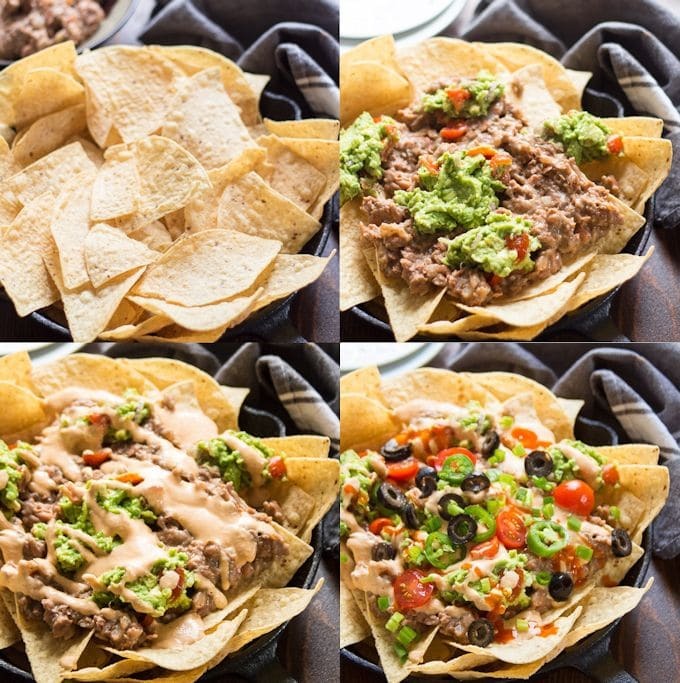 Refried beans are super important to awesome nachos as well, and fortunately, they’re very easy to make! Sauté some onion and garlic, then add the beans, some water, spices and salt. Simmer for a bit to soften up the beans, then mash them. 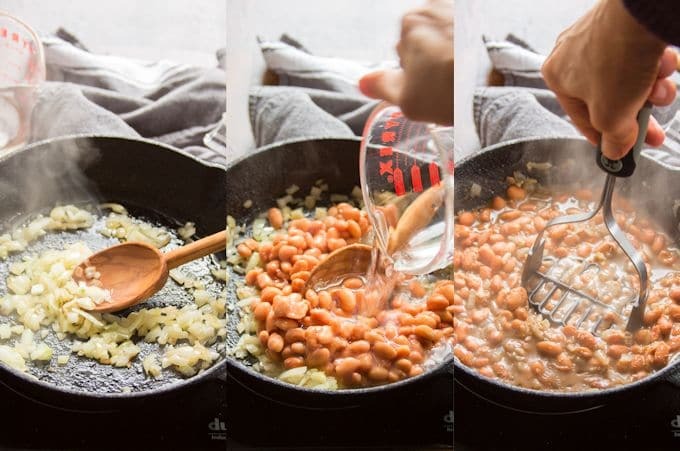 Add as much water as you like to get the beans to just the right consistency. Arrange your chips on a plate or in a pan and top with your beans, some guac, vegan queso, black olives, scallions, hot sauce and jalapeño slices. Feel free to switch up the queso with my nacho cauliflower cheese or sweet potato cheese in place of the potato-cashew cheese this recipe uses. I love them all equally! This recipe makes a nice-sized batch of queso. I don’t recommend cutting down on the batch size unless you have a small blending device. Anything too big, and it won’t blend fully! If you have extra, serve it on the side, or store it in the fridge for 2 to 3 days. Save time the day of serving by preparing the beans and cheese sauce in advance, then reheat on the stove or in the microwave. Add a bit of water to the beans if they get too thick. You can try making the guacamole a day ahead of time if your avocado is very fresh (bright green, a bit firm, and no brown spots at all) and you seal the storage container very tightly, but there is a risk that it’ll brown. Can this recipe be made gluten-free? Yes! Just use gluten-free chips! Can I just use canned refried beans? You can, just check the ingredients to ensure they’re vegan (many brands contain lard). Switch up the toppings or add your favorites! Your favorite salsa, vegan sour cream, and diced fresh veggies would all be nice additions. 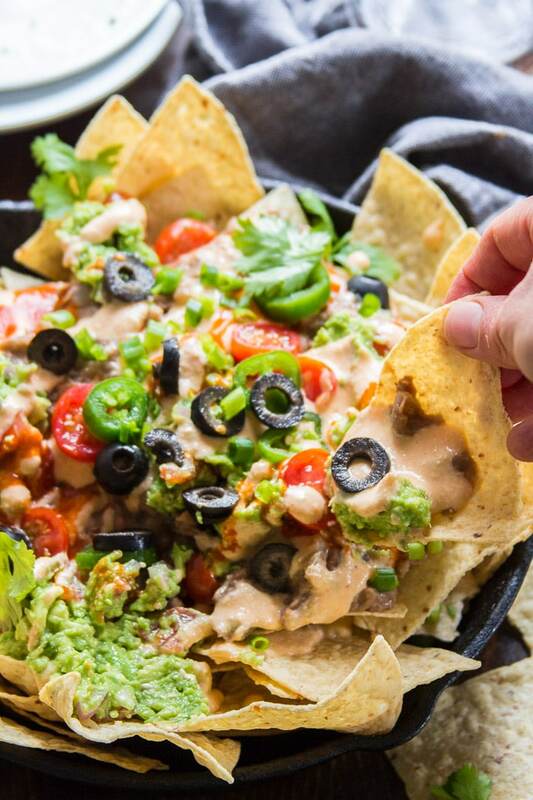 You don't need dairy to make a killer plate of nachos! 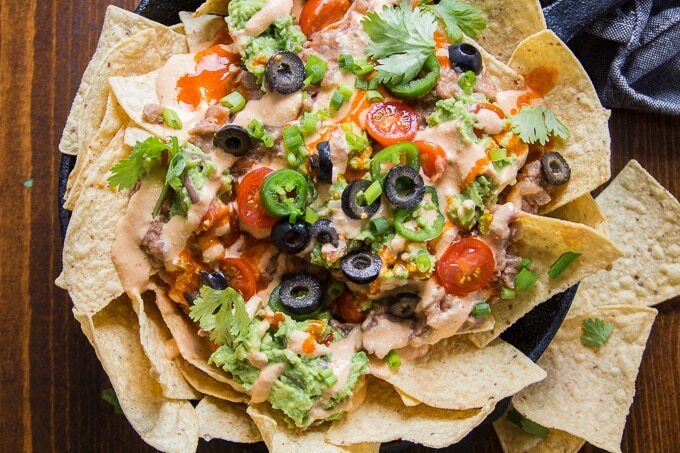 Piled high with refried beans, creamy guac, and diary-free queso, these vegan nachos will be a hit with vegans, vegetarians and omnivores alike. Watch out, because they're addictive! Place the cashews and potato into a small saucepan and cover them with a few inches of water. Lower the heat and allow it to boil for about 15 minutes, until the potato is very soft. Remove the pot from the heat, drain the water, and allow the potato and cashews to cool for a few minutes. Transfer the potatoes and cashews to a food processor fitted with an s-blade. Add 1/2 cup of milk and blend to form a smooth paste, stopping to scrape down the sides of the bowl as needed. Add the remaining milk, along with the nutritional yeast, hot sauce, salt, garlic powder and onion powder. Blend until smooth. Thin with additional milk if needed. Taste-test and adjust any seasonings to your liking. Coat the bottom of a medium skillet with oil and place it over medium heat. When the oil is hot, add the onion. Cook for about 5 minutes, stirring occasionally, until the onion is soft and translucent. Add the garlic and sauté for about 1 minute more, until very fragrant. Stir in the beans, cumin, oregano, and 1/2 cup water. Raise the heat and bring the liquid to a simmer. Lower the heat and allow it to simmer for about 10 minutes, until the beans soften up a bit. Add water during cooking if the skillet becomes too dry. Mash the beans with a fork or potato masher. Add water as needed to reach the desired consistency. Remove the skillet from the heat and stir in the salt and hot sauce to taste. Place the avocados into a small bowl and mash them well with a fork. Stir in the tomato, cilantro, onion, lime juice, jalapeño, and garlic. Arrange the chips on a large plate or skillet. Top with refried beans, guacamole, nacho cheese sauce, olives, cilantro, scallions, tomato, and jalapeño. I don’t know a single person that would not like these nachos! This would be a favorite appetizer or main dish! I’m sure they’d be a hit! Thanks Jillian!! Can i replace the nutritional yeast with miso or leave it out? It’s not a favorite taste in our family. We don’t necessarily miss the “cheese” taste.